Garden arches, garden arbors, obelisks and garden mirrors help to create focal points and interest in the garden. An garden arch or arbor can create a shady tunnel that leads to new part of the garden. A garden obelisk can be a focal point, visible from many parts of the garden, a climbing frame for a rose or clematis, in the vegetable garden as a support for tomatoes or climbing beans or used as means of marking time. Garden mirrors create an illusion or feeling of depth and can be great features in courtyards or smaller gardens. Garden Arches are readily available for sale from online suppliers. Garden Arches come in a range of forms and materials from simple lightweight aluminium of steel through to timber kit arches and custom built timber garden arches. Serving a number of purposes, garden arches can act a frames for climbing plants such as roses and wisteria, arches can also act as ornamental structures that can provide a frame for a sculpture or sundial or act as a ‘doorway’ to a separate part of the garden or ‘garden room’. Consider maintenance when installing a garden arch, timber needs to be treated or preserved before construction to help provide a long lasting structure. Garden mirrors have been around for many years, Landscapers and designers love them, especially in smaller gardens. The reflective nature is one aspect, however it is the ability of a mirror to create an illusion of depth and space in a smaller garden that really makes them popular. They also act as a focal point in gardens of all sizes, and of course the reflections of a correctly placed mirror can create interest darker corners of the garden. Mirrors can be made to look just like mirrors, they are also often designed to look like windows. If you use your imagination the addition of a mirror to your garden can create illusions, a feeling of space and add interest to outdoor areas both large and small. A Garden Obelisk can a simple, (see right) timber construction, perhaps constructed from found branches and bound with willow. Or an obelisk may handcrafted from metal, timber or stone, or perhaps even a mirrored obelisk. Obelisks date back to Babylonian times and were originally used as a means of time-keeping, really just a very big sundial. 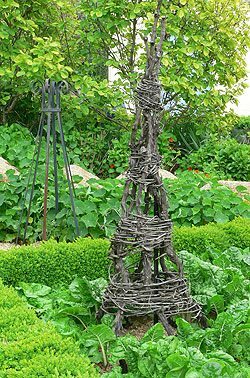 In the garden, obelisks can be used as a climbing frame for roses, clematis, beans and such, as a focal point or as a means or marking time, perhaps casting a shadow on specific plants to mark the seasons, or even anniversaries. Extremely popular in the UK and USA hand crafted obelisks are now finding a place in the Australian Garden. Looking for something special for the garden? Try a spectacular hand crafted obelisk made from metal, stone, timber or glass. Looking for a great garden project to complete with the kids, try found objects bound with willow. Hand forged, hand crafted obelisks that will stand up to any rose, and objet d’art artisan studio, giving your home a distinctive touch, selling successfully at The Red Hill Market. Custom made wrought iron and heritage style gates and garden arches in many designs and also a custom design service. Specialising in country style gates. Delivery Australia-wide. 12 Vincent St Daylesford VIC . Manufactures of quality wrought iron garden furniture, obelisks, growing frames, rose arches, pergolas, gates and sculptures. Custom made pieces for your individual needs.